Photo provided by Michael Novins. 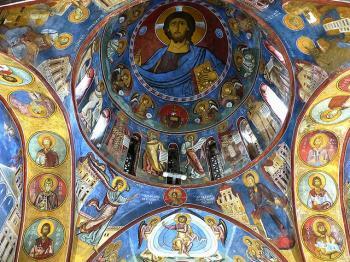 The Painted Churches in the Troödos Region are 9 Byzantine churches and monasteries in the Troödos Mountains. 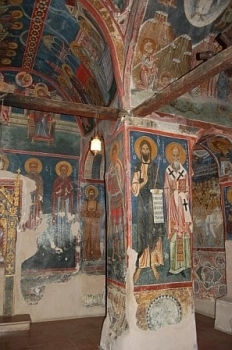 What they have in common is that they all are covered with old and colorful frescoes. Some of them date from as early as the 11th century. 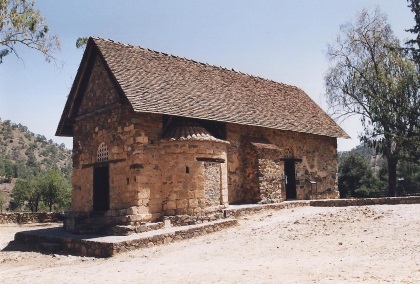 Another feature of some of these churches is that they are two buildings in one: on the inside there's the classical form of a Byzantine church, on the outside it often looks like a stable or a farm. The extra layer on the outside was constructed to be able to cope with the heavy snowfall that can occur in the Troödos Mountains. Far away, deep in the heart of Cyprus, a number of very old and special churches can be found. They are like hidden treasures, and also in the age of paved roads and cars it takes some stamina to visit them. Of the 9 enlisted churches, I visited 3: Panagia tou Asinou, Panagia tou Araka and Agios Nikolaos tis Stegis. Although they won their inclusion in the list mainly because of their interiors, I fell for their simple outside beauty. Often "just" a robust stone building, but in the best natural settings you can think of. Preparing for our trip to Cyprus, we noticed that very little practical information (opening hours, ...) can be found about the painted churches, so maybe the below is useful for future visitors. Note that we visited all 10 churches mid March, so potentially the opening hours may be different in other months/seasons. As mentioned in previous reviews, it's best to use GPS coordinates to find the churches - they are indicated below. Unlike Clyde, we never felt we needed a 4x4 vehicle but the difference might be that we used the 'avoid unpaved roads' option on our GPS. We explored the Troodos mountains for 2 days. Visiting all 10 churches in one day could maybe be possible since we departed from Nicosia and also visited other sites (Kykkos, Fikardou, ...), but this will probably be rushed. We particularly liked the churches located outside of a village (e.g. the ones in Nikitari and Platanistasa), but they are all worth a visit. 1. Nikitari: 35°02'45.4"N 32°58'24.5"E, open when we visited it on a Monday at 10 AM. 2. Lagoudera: 34°57'55.7"N 33°00'25.1"E, open when we visited it on a Monday at 10.45 AM. 3. Platanistasa: 34°58'44.8"N 33°02'48.0"E, closed when we visited it on a Monday at 11.30 AM. Coming from Lagoudera, a sign at a T-junction (right to Platanistasa, left to the church) indicates that the key can be picked up in Platanistasa. We did not do this taking into account that this would take about 30-45 minutes (back and forth) and that we were low on fuel [note that there are not a lot of petrol stations in the Troodos mountains]. 4. Palaichori: 34°55'18.7"N 33°05'41.9"E, open when we visited it on a Monday at 12.15 AM. However, note that the church is normally closed on a Monday but we were lucky that other tourists called the caretaker. This person also gave us a 10-15 minute explanation about the church, the paintings, ... which was certainly added value. 5. Pelendri: 34°53'35.4"N 32°57'58.8"E, closed when we visited it on a Monday at 14.45 PM and no coordinates of the person with the key. 6. Galata: 35°00'12.5"N 32°53'47.7"E, closed when we visited it on a Tuesday at 9 AM. On the door is a telephone number which can be called as from 9 AM but when we tried this at 9 AM and again at 9.15 AM there was no answer. 7. Kakopetria: 34°58'39.8"N 32°53'20.1"E, open when we visited it on a Tuesday at 9.30 AM. 8. Pedoulas: 34°58'03.4"N 32°49'52.8"E, open when we visited it on a Tuesday at 10.30 AM. 9. Moutoulla: 34°58'56.8"N 32°49'26.5"E, closed when we visited it on a Tuesday at 10.45 AM and no coordinates of the person with the key. 10. Kalopanagiotis: 34°59'33.4"N 32°49'48.4"E, open when we visited it on a Tuesday at 11 AM. Finally, note that in most churches taking pictures inside is not allowed. However, the caretaker at Palaichori did not mind and in Pedoulas there was no caretaker at all. I visited this WHS in February 2016. 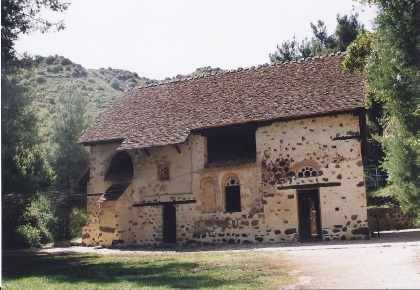 It is made up of a series of 10 or 12 painted churches high in the Troodos region of Cyprus. The official map indicator offered by UNESCO gives 12 GPS coordinates while the description only mentions 10. Since I had enough time I visited all the churches even though the 'latest' additions were closed for restoration. I'd recommend renting a car and most importantly a GPS navigator. I brought my GPS along with all the saved coordinates and still visiting some of the churches surely wasn't easy. If possible, I'd suggest to approach the Troodos region coming from the capital Nicosia instead of what I did, i.e. crossing inland from Limassol. The route is much more scenic on the latter option, however you'd be better off on a 4x4 vehicle to be on the safe side as you'd be able to venture down the several tractor trails or minor roads to get to all the churches in a sort of loop. I managed with a non-4x4 compact vehicle but there were several moments when I thanked my lucky stars that I managed to do this without damaging the car or worse getting hurt. I have to say that I really enjoy these kind of WHS (a series of less-known sites). Ihe Troodos region reminded me of the Val de Boi Churches in Catalunya. In my opinion the interior of the painted churches of Troodos is their definite highlight and why they have OUV, even though their exterior is quite unique too albeit simple at the same time. My favourite interiors were in Agios Ioannis Lambadistes, Panagia Phorviotissa Asinou, Panagia tou Arakos and Agios Nikolaos tis Stegis. These had incredible colours and detail and were in very good condition overall. When churches were closed, I simply asked around in a cafeteria or shop and immediately the friendly locals would call the keyholder! It was really quite an experience and goes to show how laid back life still is in the Troodos region. You won't be able to visit them all if you're in a hurry and you won't enjoy your visit if you're in a rush. I spent 2 full days exploring and it was really worthwhile. Visiting solo in the low season meant that I could easily take several photos and enjoy the quiet environs practically alone. Visiting the churches was completely free even though I bought quite a lot of interesting books and postcards in most of them. My favourite church exterior was that of Panagia Phorviotissa Asinou, which is the most accessible, and in front of which there is a marble Unesco plaque. Almost all the other sites have an individual plastic/metal Unesco sign attached and I'll surely make a photo collage of them all in my free time. The 2 painted churches (+ another non-inscribed one) in Galata offer a great place to stop to eat and to enjoy exploring a Troodos village. Even though the weather was sunny and quite hot at daytime (in February! ), the roads close to Mount Olympus (1,952m) and the mountain peaks were covered with melting snow so you should keep this in mind if you visit in December/January. Overall, I really think this is the best WHS in Cyprus and one of the best 'minor/unkwnown' WHS the list has on offer. 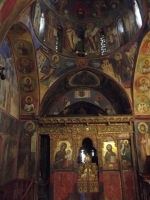 5 were restored and open to visitors (Galata, Pedoulas, Lagoudera, Nikitari and St John's Monastery). 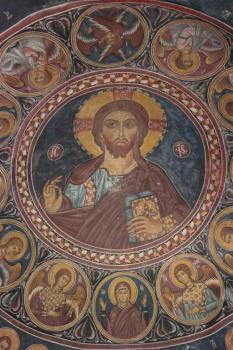 Of the ten churches only Nikiteri and Lagoudera rated 'spectacular' frescoes, while others were damaged or patchy. Of all the Troodos churches, I've only been to the only one easily accessible by public transport from Nikosia - the one in Galata. We took the effort to go there from Famagusta in Northern Cyprus and were very much disappointed. The paintings were nice but nothing out of the ordinary. I have seen much more beautiful ones even in Nicosia. Only the paintings in the apsis survived (and one other fragment) which was also a bad surprise as I imagined them to cover the entire church (again like in Nicosia). The church was badly lit (in order to preserve the frescoes) and the apsis which is the only interesting section of the church was not accessible to anyone but the local priest. So even in the dusky inner room of the church we still had to admire the paintings through a wall! A (partial) compensation for this unrewarding visit was the nearby charming village of Kakopetria with its cubbled streets. I sure hope the rest of the Troodos churches are better! I visited the Metamorphosis Church (one of the inscribed churches) in the mountains. The most interesting experience for me was knocking on a few doors near the church to finally get the "keeper of the key" to open the church for us. And the beautiful frescos in the church was worth all the effort. No exception as well to the beautiful location the church was situated and the friendly people we met on the way up the mountains. Definitely worth a visit! Built in the 12th century: Among the most significant cycles is that of Panagia Phorbiotissa of Nikitari, which was traced back to 1105-06 thanks to a written dedication, and that of Panagia tou Arakou in Lagoudera, which was executed during the last six months of 1192 (Unesco). 130 Community Members have visited.